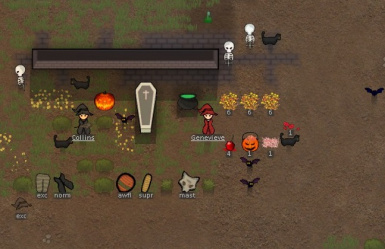 Just because you're stuck on a Rimworld doesn't mean you can't celebrate the best holiday - Halloween! - Witches Hats + Robes for all body types, + striped stockings! - Vampire costumes for all body types! - Spooky Skeletons, oh no! - Candy Corn, Candied Apples, Wax Lips, Chalk candy and Trick or Treat baskets! With more costumes, candy and spooky things to come!